This one makes me want to talk a little bit about continuity and status quo in the Band Vs. Bandverse. It’s something I’ve thought a lot about. I knew almost right from the beginning that I *didn’t* actually want this to be a Status Quo Frozen Universe — either the kind where nothing ever changes, or the kind where plot developments have no significance due to everything always resetting back to square one. The balance, though, is that BVB does have this episodic format that revolves a lot around establishing patterns, and it kinda references a bunch of mostly-frozen universes like, say, Archie. For this page, when the bands meet again after a summer of not being directly versus each other, I wanted to do a *really* Back To Square One thing — like, the most basic BVB scenario. They’re all out in a public place, and Turpentine’s vaguely up to no good, and Honey Hart’s got a PSA lesson to bring up…and things *have* changed somewhat for these characters over about 130 pages, but this moment has a certain veneer of acting like they haven’t. I wonder if there’s a word for that awkward moment when people who don’t really like each but don’t necessarily hate one another are made to hangout. Or maybe people who fancy each other but don’t really know that they fancy each other meet up. but for their fellow band mates hanging out together the word for it is a mystery. I kinda got the impression that the rivalry was limited to the egos of the lead singers and the pooping habits of Cherry’s pooches, but outside of that the bands had at least a nodding relationship. Yeah! Turps and Honey eyeballing each other again! Ah, the smoldering confusion, the moral high-horse versus the determined nay-sayer! Love this world, you let us visit, Kathleen. Thank you. Two suggestions- First, think about throwing on a link to Paypal or some similar site so that we, your appreciative readers, can throw you some dough once in a while. Second- have Honey make Turps a dress entirely from bandages. You know she would wear it. …Honey would make an extremely well-constructed and elaborate dress out of bandages, with a matching parasol. She didn’t win first prize at the fashion show at First Aid Camp for nothin’. I don’t know which idea I like better- HH just putting on a fashion show by herself, or that first aid camp fashion shows are a thing that happens in the BvB universe. Gosh, I ship these two hard. <3 And that moment when Honey Hart shows up to halt the littering is true to the cartoons I watched as a kid. 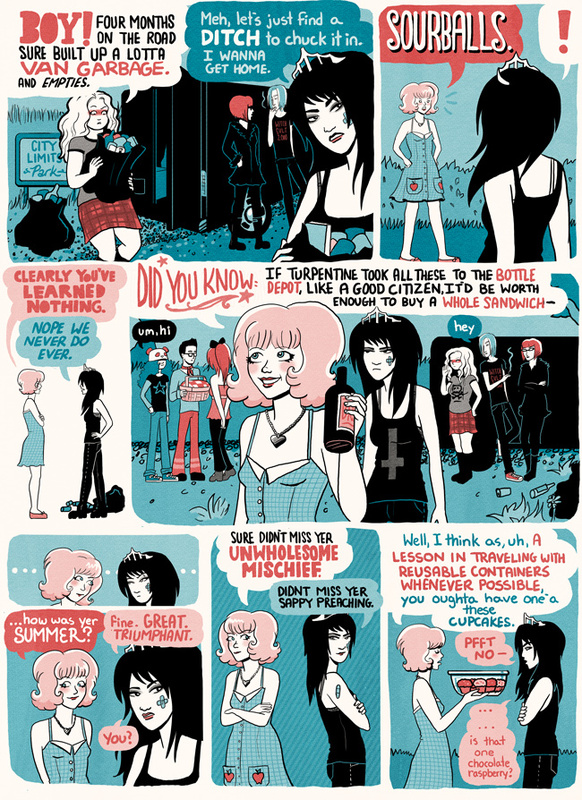 This comic is a such a grown-up nostalgia trip. Also, I really like the detail you put into their clothes. Thanks! Yeah, I really like incorporating some of that nostalgic Saturday morning cartoon feel, and that’s most obvious with the ones where there’s some kind of PSA message. And, yeah, clearly I love doing the clothes. I think it’s such a great part of defining characters — and comics is such an excellent medium in which to Love Clothes, because it’s like having complete control of a wardrobe department where money is not a factor and anything you want can instantly appear.